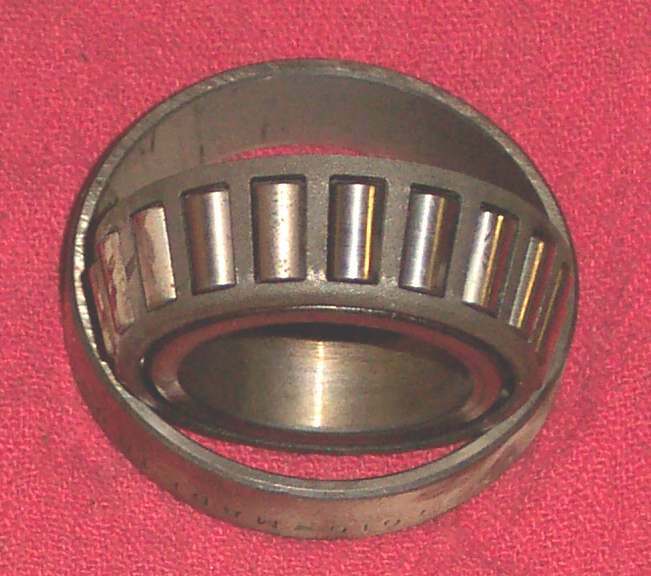 ¶ Roller Bearings use precisely made steel balls or cylinders to allow a shaft to turn with very little friction. In most applications the balls or rollers are caged so they will stay in place. 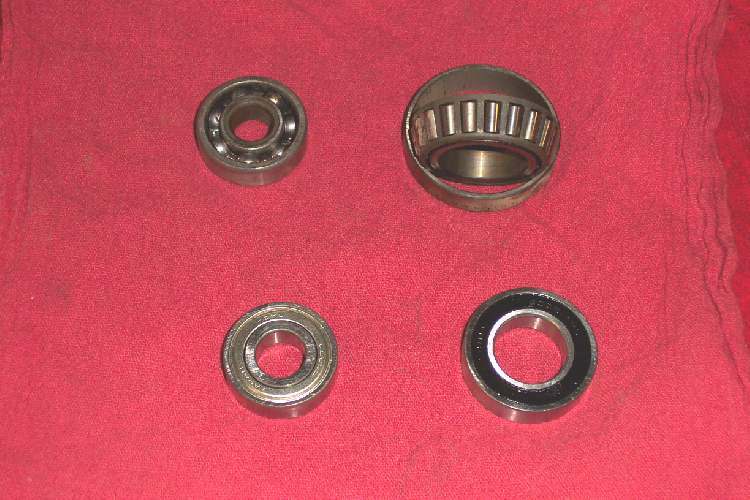 There are many different sizes and types of Roller Bearings. They are used all over a motorcycle on Rods, Camshafts, Transmission Shafts, Main Bearings, anywhere a shaft needs to turn AND anywhere lubrication could be marginal. The main style of Roller Bearing used on motorcycles is the Ball Bearing. The Ball Bearing uses, as you might guess, precision made steel balls. 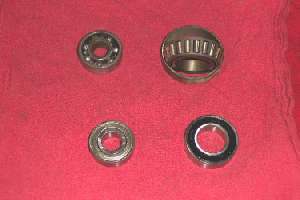 There are three basic styles of Ball Bearing. Shielded with a steel shield on one or both sides. Shielded with a rubber shield on one or both sides. Unshielded Bearings work well for Two Stroke Crankshafts. They are lubricated by the oil in the gas. They are also used in transmissions and camshafts. These are lubricated by engine oil. Shielded bearings work good where there is limited outside lubrication like wheel bearings. They are pre-lubed with grease. If they have a rubber shield you can usually pop it off and relube the bearing. Steel bearing shields are very difficult to remove and are usually so deformed by removal that you can't reuse them. Sometimes, Ball Bearings can be a very tight fit on their shafts. If you pull them off a shaft and want to reuse them you MUST apply pressure to the inner bearing race. If you apply pressure to the outside race you run the risk of ruining the bearing and bearing failure can cause all kinds of nasty problems. If you must pull with the outside race, replace the bearing. Ball Bearings used on crankshafts, camshafts and in transmition cases are sometimes an interference fit on the shaft or crankcase. This means the diameter of the shaft is just a bit BIGGER then the size of the inner race on the Ball Bearing. To get the bearing on the shaft you gently heat the Ball Bearing up to about 250 degrees Fahrenheit and cool the shaft in a freezer. The hot metal expands just a bit and the cold metal shrinks just a bit. If you are quick, the bearing will go right on and then lock to the shaft. 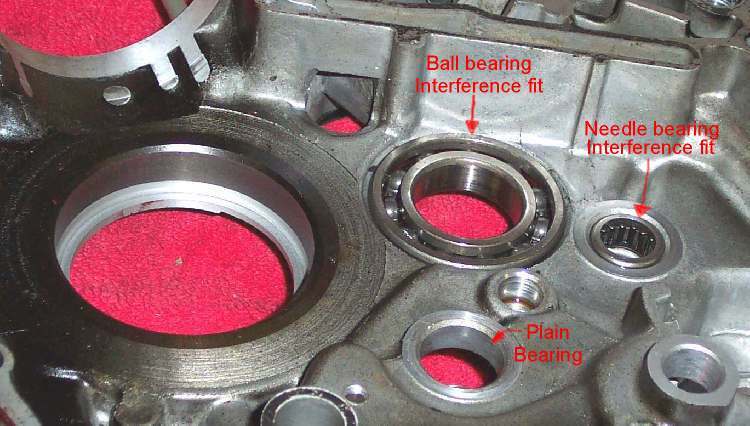 If the bearing is an interference fit with a crankcase, you simply do the opposite. Freeze the bearing and gently heat the crankcase. Again, if you work quickly, the bearing will pop right in. While a lot of camshafts run in Plain Bearings some have Ball Bearings. 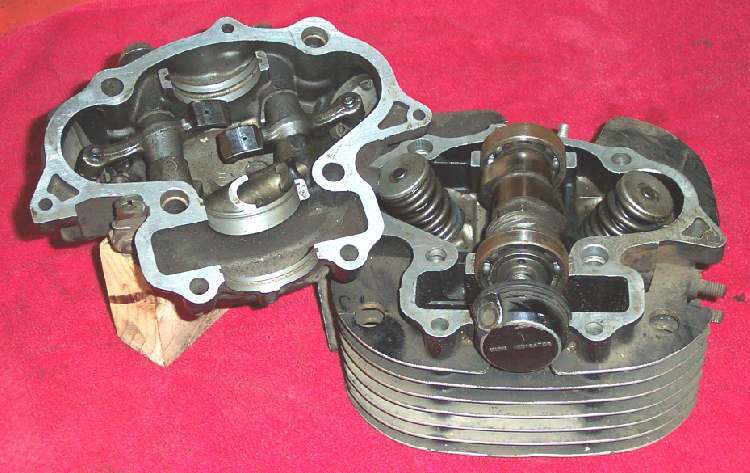 I like this design because even if the engine is run low on oil and the bearings, camshaft and rocker arms are ruined there is still a good chance that the cylinder head is still good. With Plain Bearings there is no chance. When a Ball Bearing starts to fail the shaft can size up. If you turn the shaft back and forth a bit it can seem like it breaks loose starts turning OK again. Don't be fooled. As you can see from the picture some of the bearing balls are missing, allowing the shaft to bind up. The shaft might still be saved, but not if you break it loose and start the engine again. Roller Bearing come in many different styles to fit many different applications. Tapered Roller Bearings can be used for wheel bearings or steering head bearings. These bearings are adjustable. As they wear you can retighten them to eliminate the looseness that wear gives the bearing. 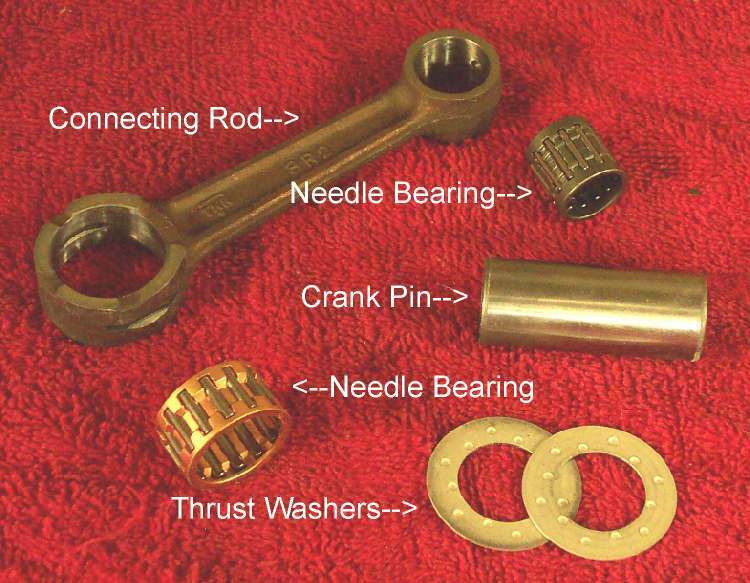 Caged Needle bearing are used on both the big and small ends of most two stroke rods. There are just all kinds of Roller Bearings for all kinds of applications. You can measure the inner race diameter, outer race diameter, and width of a bearing and find out it's size. The size is sometimes stamped on the side of the bearing and sometimes not. At one time all the good bearings came from the USA or Germany. Now everyone seems to be making them. 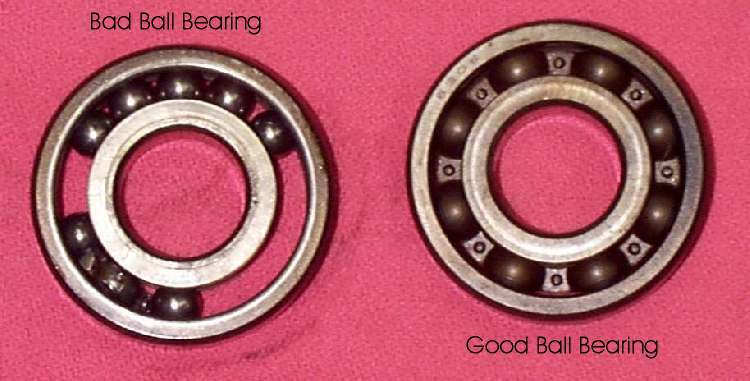 I once asked a friend at a big bearing sales company about this and also where were the best bearings to be found. He said he felt it didn't make much difference where you got your bearings from. He said all the bearing where made with automatic machinery. If the bearing came from some weird third world country, odds are they had new machines and the bearings were OK. I've put bearings from a lot of strange countries in a lot of different machines. I've never had any problems with any of them, so I guess he was right. I was once told that aircraft Ball Bearings were made to more exacting specifications and therefore ran with less friction. This in turn gave more horsepower. This may have been true in the past but as my Bearing House friend said, they are all made on newer, very accurate, machines now. Just use bearings from a reputable distributor and they will work just fine, no matter where they were made. Copyright � 1999-2006 dansmc.com. All rights reserved.